Aimed at the general membership, from total beginners to the more experienced individuals seeking to increase their skills, the Ottawa Section offers a number of basic and specialized courses during the year. Most courses are held locally, usually in the Gatineau Park. Courses focus on the core activities organized by the Section, including rock and ice climbing, mountaineering, hiking/navigation, and skiing. 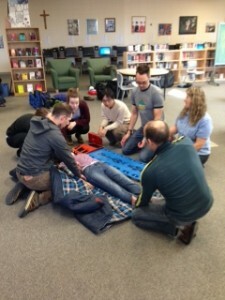 General outdoor and safety courses are also offered such as wilderness first aid, avalanche rescue, leadership training, etc. Courses are taught by local (and contracted) qualified instructors and tend to include a fee to participate. 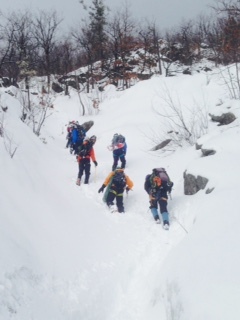 Clinics/Workshops and Beginner days (including intro to mountaineering) are usually supervised by experienced Section volunteers and are intended to be a more informal way for members to share knowledge amongst themselves. Clinics/Workshops usually involve minimal costs, and are intended as compliment to courses; they are a great opportunity to review knowledge learned in courses. With the recent success of women climbing outings, the Section is also looking to offer some women-only clinics. Rock- and ice-climbing “Beginner’s Days” are a great Ottawa Section tradition. These introductory courses consist of an equipment orientation evening, followed by a full day at the cliffs where you can climb with the help of a group of experienced volunteers on nearly a 1:1 basis. Learn and practice the basics of climbing safely, and become familiar with the equipment used in rock and ice climbing. A group pizza party or barbecue usually follows a day’s hard work – and is a fitting end to a great day. 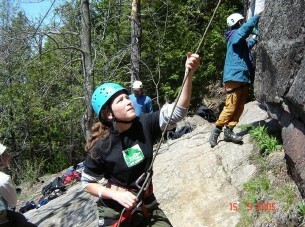 While the Ottawa Section activities are largely centered on rock and ice climbing, our mountaineering roots show through each summer. As part of our annual section camps in Western Canada, members can take advantage of “Introduction to Mountaineering” days. ACC-Ottawa members learning how to move someone if they got into trouble out here! As some of you may be aware, the Section has seen a very important growth of new members in recent years. While this is definitely a good sign and a cause to rejoice, the Section is now faced with the challenge of recruiting more trip leaders capable of organizing lots of interesting outings for our growing membership. The Alpine Club of Canada is a volunteer-based organization that can only flourish with the involvement of people like you. No need to be intimated and think that you aren’t able to contribute! To facilitate the recruitment of trip leaders, and in order to better prepare actual and potential leaders, we have decided to put together a leadership development series of courses. The goal of this training opportunity is to develop capable, safety conscious trip leaders. The courses that fall under this series will be heavily subsidized and registration priority will be given to members who have already volunteered with the ACC Ottawa Section and those who are keen to continue contributing in future. This series includes a general leadership course; specific skills courses (for climbing); a navigation course; and a wilderness first-aid course.